Last weekend, I finally was able to get away and get recharged thanks to a dear friend. When I first started learning how to ride a motorcycle again, my late husband joined the TW200 community forum to learn more about these bikes. It was on this forum that we learned about a meet up and ride in Desert Hot Springs five years ago. It was being hosted by Jeff Bowman, the owner of the Living Water Spa. It is a privately owned “European style” clothing optional resort with natural hot mineral waters spa. We were offered a special rate to stay the night after the ride. At first my late husband was a little bit uncomfortable with the idea. I suggested that we give it a try since our motto was always to try it once. I also suggested that if we were too uncomfortable that we could always excuse ourselves and I’m sure that they would understand. I’m grateful that we chose to stay the night. We met a wonderful couple, Jeff and Judy, and got to hear their story of how they came upon to be the owner of the resort. Their story began 41 years ago when Jeff and Judy first met at a Bible College in Michigan. Jeff is a native of California and Judy is native of Chicago. After graduating, Jeff began ministering at various churches but after four children they discovered that they were struggling to make end meets. So they decided to move to California to be closer to Jeff’s parent and Jeff got a lucrative job at Toshiba. However, his original calling was luring him back into ministry. Jeff got offered to become a pastor up in Monterey County. Since Toshiba had a wonderful insurance package, Judy decided to get the family one last final check up before they moved. It was from that check up when their world turned upside down. While in the middle of packing up the house, Judy got a call from her doctor to inform her that they discovered a lump in her breast. After discussing at length with each about her diagnosis, they decided to turn down the job offer at the church and continued to work at Toshiba so that Judy can get the necessary medical treatment. She has beaten the odd against breast cancer and now has been in remission for 22 years. During that time, Jeff began struggling with personal issues of feeling jealous and possessive of his wife while she is receiving treatment. It bothered him that doctors, surgeons and nurses get to see his wife body which he felt and taught that it’s a sacred temple to be only shared between a man and his wife. So, as a man who seeks knowledge began researching how to overcome his insecurities. It is where he came upon information about clothing optional resort as way to be comfortable with one owns body. At first Judy was reluctant to participate in Jeff’s quest for knowledge but over time she became willing to try new things with him. With the more places they visited the more they became comfortable with their body and the more they seek more knowledge about the body. They learned about various types of massage and became massage therapist themselves. 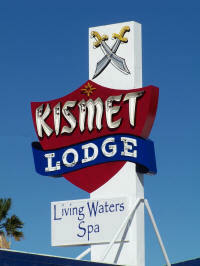 During this process they stumbled upon a resort for sale in Desert Hot Springs called Kismet Lodge. After thinking long and hard they decided it was time to make a change in their life and purchased it 11 years ago. Our friendships with Jeff and Judy began 5 years ago after our first ride and have grown to become like family. Jeff even presided over our celebration of marriage and our remembrance of my late husband memorial. Jeff and Judy have opened their door to me as a place to seek solace. It’s here where I can begin to rejuvenate again. I’m forever grateful for their warmth and love that they have shown me during the difficult times. Just like Kathy’s story in Pie Town, Jeff and Judy’s story of experience, strength and hope gives me the courage and strength to continue my journey in finding my own two feet again.